Antwerp is bidding to be Europe’s top spot for a stylish weekend on the tiles. There's something afoot in Antwerp. The Flanders port city, which most of us might struggle to associate with anything other than diamond-trading and not being as pretty as Bruges, has spent the past decade quietly and effectively climbing the European social ladder. It's been accumulating elegant new museums, stylish bars and cafes (4,000 night spots and counting), and high-cachet shops, in a dogged pursuit of fashion-conscious self-improvement that makes the recent sprucing up of our own provincial capitals look like the superficial scattering of a bit of lottery cash and a couple of Starbucks by comparison. A Belgian city getting cool? This sounds like something one needs to see for oneself. At first sight, from the inevitably efficient tram into Antwerp's centre, the tall, tightly packed merchants' houses, prosperously clad locals and Kensington-style clusters of private galleries, boutiques and swanky-looking restaurants brings to mind Albert Camus's damnation of this city's great mercantile rival, Amsterdam: "A very bourgeois hell." 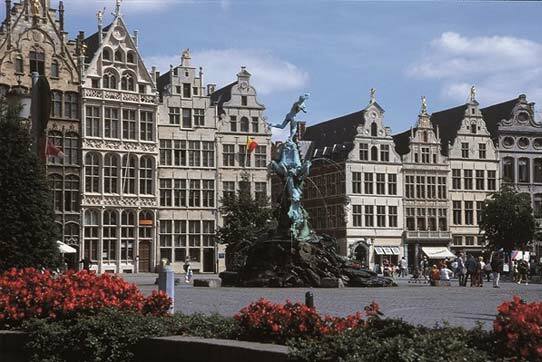 But the heart of town is a more democratic affair, with the main shopping street, the Meir, leading into the spacious and sociable Groenplaats square, overlooked by the enormous Cathedral of Our Lady. It's here that the first big revelation of your weekend in Antwerp will strike you, hard - you're simply not well enough dressed - the city is home to one of Europe's best fashion museums, the Fashion Academy and shops, shops, shops. Secret openings, hidden entrances, experimental menus and reputations that rise and fall faster than a mango soufflé are all part of the restaurant scene here. Absoluut Zweeds was my favourite example of the culinary quest for the new - Scandinavian sushi tapas, anyone? - but if you're looking for a slightly less rarefied meal, Velvet Lounge is a surprisingly long-established favourite, offering smart cookery in a lively bordello atmosphere. After dinner, I went in search of the city's split personalities. The first side is easy to find - behind dark oak doors and steamed-up windows, traditional, devoutly unfashionable local pubs are populated by round men with sweaty moustaches and women the colour of nicotine, urgently downing and ordering beer and gin as if last orders were but seconds away (it never is). If you can get out of there walking, the second Antwerp, of shabbily gorgeous fashion students standing in mute appraisal of an unsmiling DJ in a purposely down-at-heel underground bar, is equally prevalent, if mildly cheerless. Finally, though, your expensive new outfit can find its home, in the bars designed to host Antwerp's seemingly innumerable glamorous young professional sorts. Hangar 26, an elegantly restored dockside building with balcony views across the River Scheldt, is the current leader of this pack - you'd be forgiven for thinking that drinks are free for anyone dressed head to toe in figure-hugging black, provided the figure is flawless. Yet, while the tailoring might be intimidating, the locals aren't. Perhaps because of Antwerp's still relatively low continental profile, its chatty, unpretentious in crowd seems to remember what, for example, London's or Milan's forgot years ago: that looking fantastic is the start of a great evening, not the point of it. Though a relatively small city, Antwerp is a fine place to walk off a hangover. The ground-floor living rooms and kitchens in the posher parts of town make for excellent interior-design voyeurism, and the local street-food options, chocolate waffles or chips with mayonnaise, seem purpose-built for soaking up excess. And it was the waffle, oddly, that sparked off Antwerp's second big revelation - it being the first uniquely Belgian encounter of the weekend. Among the Irish pubs, Italian cafes and Swedish restaurants, window-shopping at Louis Vuitton and Giorgio Armani, and engaging in a cheerful linguistic banter with the shop staff and waiters - "Flemish, German, English or French, sir? And do you want ice and lemon with that?" - you start to understand why Antwerp is leaving its terminally unhip motherland behind. This isn't Belgium, this is a country called Europe - and it's cool. Designed by American-born architect, Michael Graves, this architecturally impressive Radisson Blu Astrid Hotel in Antwerp offers guests contemporary cosmopolitan elegance situated across from the city's historic main rail station. This new boutique hotel in Antwerp is located in the heart of the city's Diamond District on Koningin Astrid Square near the famed Zoo Antwerpen. On Saturday nights, it's best to book all meals. At the time of writing, Absoluut Zweeds (03 237 2843, c) is in a quarrel with its financiers, and isn't open; when, with luck, it returns, try the £40 sampler menu. De Kleine Zavel is a modish but laid-back Mediterranean eatery that the locals adore. Velvet Lounge www.velvetlounge.be offers dining, drinking and dancing with style and panache. De Kaai in Hangar 26, is a full-service night out too, with stylish food, drinks and revelry on tap. De Vagant, on Reyndersstraat, is the city's premier gin bar, with more than 300 to tipple. You can get quality chips and waffles on Saturday and Sunday mornings at the market on Theaterplein. Café d'Anvers, on Verversrui, is the grande dame of Antwerp nightclubs, but visit www.noctis.com to find the cutting edge, if that's your thing. The tourist office is on the Grote Markt (00 32 3 232 0103, www.visitantwerpen.be). The city at the cutting edge of pan-European living? Now that is something to see for yourself.